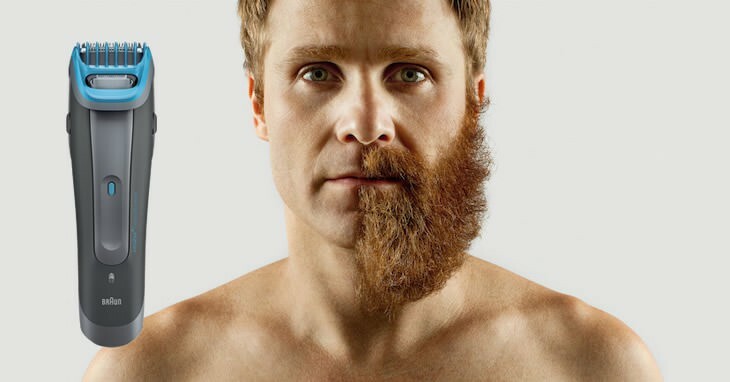 Men don’t need to buy two different trimmers for beard and head. 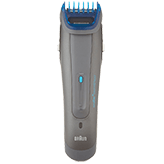 The Braun Cruzer 6 is all you need to get a clean smooth trim for beard or hair, even in the style you want. Save space in the bathroom from having to store two different hair trimmers, with the Braun Cruzer 6. It’ll give you a clean accurate shave, with a minimum of fuss. It’s easy to hold in the hands, and the battery charge will last a long time. It’s not easy to drop in the sink. 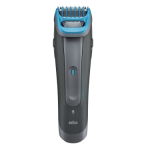 The Braun Cruzer 6 is an electric cordless trimmer for beard and head. It’s available in a grey and blue plastic casing. 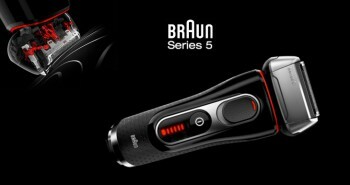 Braun claims that it’s their most powerful beard trimmer. 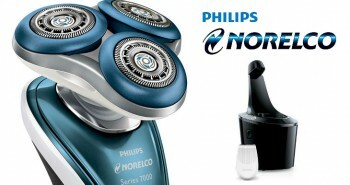 It has a dual battery system that will adjust to shaving the toughest thickest beard hair. It has two detachable shaver combs, that click and lock. This gives you the option to trim and cut up to twelve different lengths, from 1 to 20 millimeters. You can go from a fully trimmed beard to subtle designer stubble. Give yourself a powerful beard or hair trim. This is an easy and hassle free trimmer to use for styling and trimming. The Braun Cruzer 6 will provide an even trim, so both sides of your face or head will appear the same. The trimmer slides up or down, depending on height of cut wanted. The sliding trimmer can get into those hard to reach places, such as when you sport a goatee. When one of the two combs are attached, the trimmer still works perfectly. Whether you’re looking for a simply shave, or something a bit more stylish, there is also a smaller precision trimmer on the Braun Cruzer 6. This small trimmer was designed for convenient beard styling, to get into hard to reach spots. You can give your beard exact shapes, and contours, without having to remove the comb. You can work with lines, patterns, and shapes, all with the use of the handy trimmer. The Braun Cruzer 6 is completely waterproof, so you can easily wash it out after each usage. It has a fully sealed body, to protect its mechanics from water and moisture. This keeps dust, hair, and water from entering the shaver. To clean after each use, simply rinse under warm running tap water, shake the water out, wipe with a towel, and allow the rest to air dry. The Braun Cruzer 6 is built with an ultra sharp stainless steel trimming element. This enables you to go for the most defined beard style, or to go for a casual look. This shaver is built with a beard comb, and it has six settings to correspond to the look you want. These settings will enable you to chose a perfect stubble look, or a full beard look, from 10 to 20 millimeters. You can still use the trimmer without the combs though, and it’ll work perfectly for getting the style that you want. The dual battery system will adjust to all hair conditions. It’s built with a powerful motor, making it easy to trim all types of hair, from lightest to thickest. Its motor stays constant, without increasing or decreasing, so that you can shave in tough conditions, without losing power. It’ll stay constant, even when the battery charge is wearing down. It’ll even give you an even trim, so that you can do both sides of your head or face, without having to worry about irregularities due to a faulty motor. You can shave as often or as little as you need to. For your hair, there is an adjustable hair comb that has six settings. You can precisely trim your head for any hairstyle. The settings are adjustable to 10 to 20 millimeters. The Braun Cruzer has a long battery life, so that you can shave for longer. It takes one hour to fully charge it up, which gives you forty minutes of trimming usage. On the front of the unit is an LED charging and low charge indicator, so you know when you need to charge it up again. 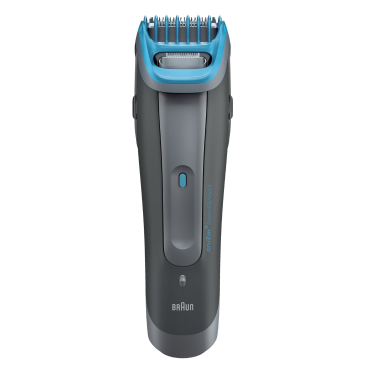 The Braun Cruzer’s cheap price, making it the perfect multi-purpose trimmer. It has worldwide voltage of 110 to 240V. Inside the box you’ll get one Cruzer trimmer, an attachable hair comb, an attachable beard comb, and a travel pouch. For men who like to keep their hair short, or even shaved, as well as having to deal with a beard, mustache, or stubble, the Braun Cruzer 6 is the best choice for grooming. It’s a two in one shaver, so you can save space in the bathroom. It’s also affordable enough to buy for only one aspect of trimming as well.